Finding time alone with your spouse can be tough on a trip with kids. One of our favorite tricks is to go for a bedtime walk and put the kids to sleep in a stroller or sling. Then we're free to talk, stop in for a drink, or just enjoy the scenery. 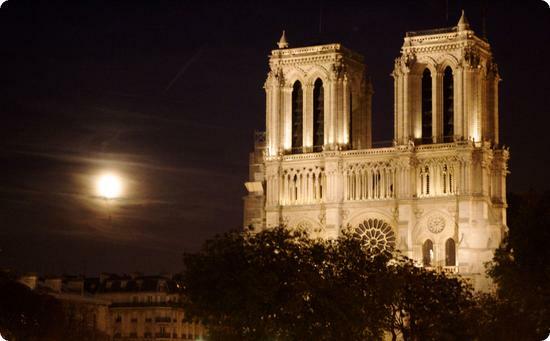 What could be better than a moonlit walk in Paris? David on August 5, 2010 at 3:13 p.m. I just took the boys out for lunch (at Tutta Bella) and we were making maps of Italy and discussing where to go next. I think we decided on France and were talking about Madeline and the tower. This was a well timed post. You get all 3 asleep at once? My guys would be running all over the place. Crystal aka Travelers Barista on August 5, 2010 at 6:54 p.m.
Beautiful Photo! Mine will have to wait til tomorrow. Can't wait to someday see Notre Dame myself! Carolina on August 5, 2010 at 11:42 p.m.
La bella luna! Very romantic photo. soultravelers3 on August 6, 2010 at 4:22 a.m.
Beautiful photo of Notre Dame at night and great idea too! We're in Provence now heading slowly back to Paris again. Looking forward to showing it all to my daughter again at 9 as she was last in Paris on her 6th birthday. With older kids and early readers, a good thick kids book is a wonderful way to allow parents to have many, long romantic dinners while traveling. ;) Keeps everyone happy. Mara on August 6, 2010 at 4:23 a.m. I'll never forget the first me I saw Notre Dame - it was illuminated just like that on a warm September evening. When we were in Paris I brought help because I knew that I would want to be able to see the city at night. With little ones, your solution is a great idea. Why consign yourself to daylight hours only? Alison on August 6, 2010 at 6:51 a.m.
Great ideas for enjoying an evening in Paris with your kids! I went with my 5 year old daughter and we loved it. We climbed the stairs in Notre Dame (I think my legs still ache!) and had a chocolate crepe from a street vendor nearby. The parks were great to visit with kids as well. Elizabeth on August 7, 2010 at 1:32 p.m.
A night time adult time walk with kids in tow? Brilliant! Paris France on February 15, 2011 at 9:55 a.m.
A very nice picture! I have seen Notre Dame last summer and I would say it's more impressive inside than outside. Milena Yordanova on July 10, 2014 at 1:29 a.m. Awesome night photo of Notre Dame! Love the way you captured the moon.